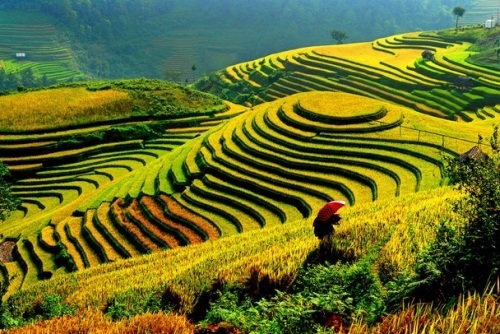 Vietnam Airlines has dropped the price of some of their flights from Vancouver to Ho Chi Minh City (SGN) and Hanoi (HAN), Vietnam down to $747 CAD roundtrip including taxes. This is about 34% below the typical price from Vancouver to Vietnam. 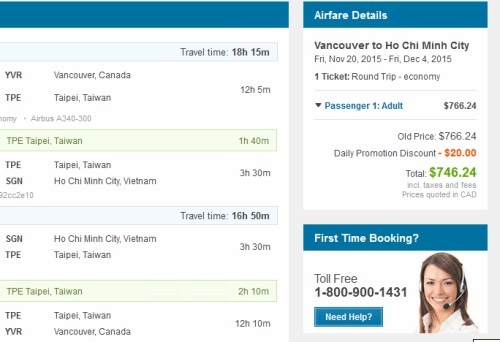 The Vancouver - Ho Chi Minh City flights have one stop each way, in Taipei, Taiwan and are close to as fast as Vancouver - Vietnam can be done, with 17 hours of total travel time (including the layover) each way. 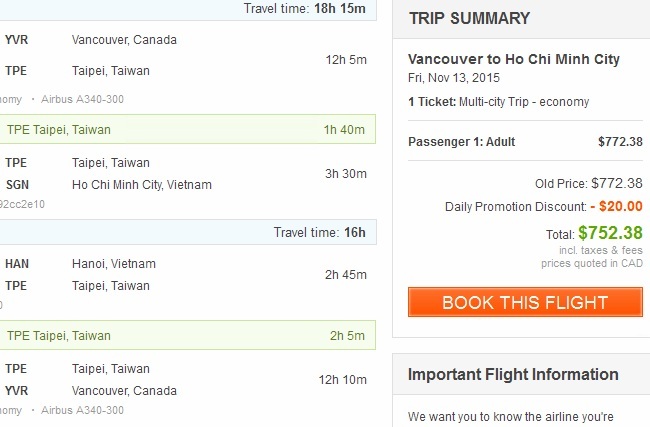 The Vancouver - Hanoi flights are the same duration on the way there (1 stop in Taipei) - but on the way back they have an additional stop (in Ho Chi Minh City), which tacks on an extra 6 hours to the trip. You can also fly into Ho Chi Minh and back home from Hanoi for a total price of just $752 after taxes! Doing this also avoids the extra stop on the way back, so it's fast flights in both directions. I'll show you how to do this below. This price is available for fares from late September, through October and November, and into early December 2015. Good time to visit Vietnam? November and December are good months to visit Vietnam. The later in November the better. October can still be rainy. 1. Start with one of the example Kayak searches below. When you get to Kayak, you may want to hit the 'Change' button and modify the number of passengers. 2. Click through from Kayak to CheapOair or FlightHub to complete the booking. The flights on FlightHub are coming up at $746 CAD, while CheapOair seems to be coming up at $754 CAD. 1. Go to FlightHub or CheapOair. In this example, I'll use FlightHub. 2. Click on 'Multiple City' (if using FlightHub). On CheapOair, click on 'Multiple Cities'. 3. Under 'From' enter 'Vancouver'. Beside 'Depart' enter one of the example Departure dates from above. November 13 for example. Beside 'Depart' enter one of the example Return dates from above. November 27 for example. 5. Now change the number of passengers if you wish. Right above where you enter the number of passengers you also need to click on 'Remove Segment' to remove the blank third segment before searching. 6. Now hit the 'Search Flights' button. You can now start picking your flights. Important: There are a few different flight options available for each leg of the journey. For the Vancouver - Ho Chi Minh City leg, pick the one that is 17h 15m. It's probably near the top of the results. 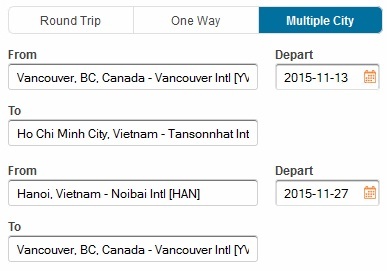 For the Hanoi - Vancouver leg, pick the one that is 17h. You may need to scroll down quite a bit to find it. It may have a price of $752 beside it. Note that this is the *total* cost for both directions of the trip. vancouver, yvr, flight deals, asia, southeast asia, ho chi minh city, hanoi, sgn, han and vietnam airlines. One Response to "Vancouver to Ho Chi Minh City or Hanoi, Vietnam - $747 roundtrip including taxes"